The fifth Down Harbour Race for the season was held yesterday, with not a lot of wind forecast in the period of the race a relatively short race was set. 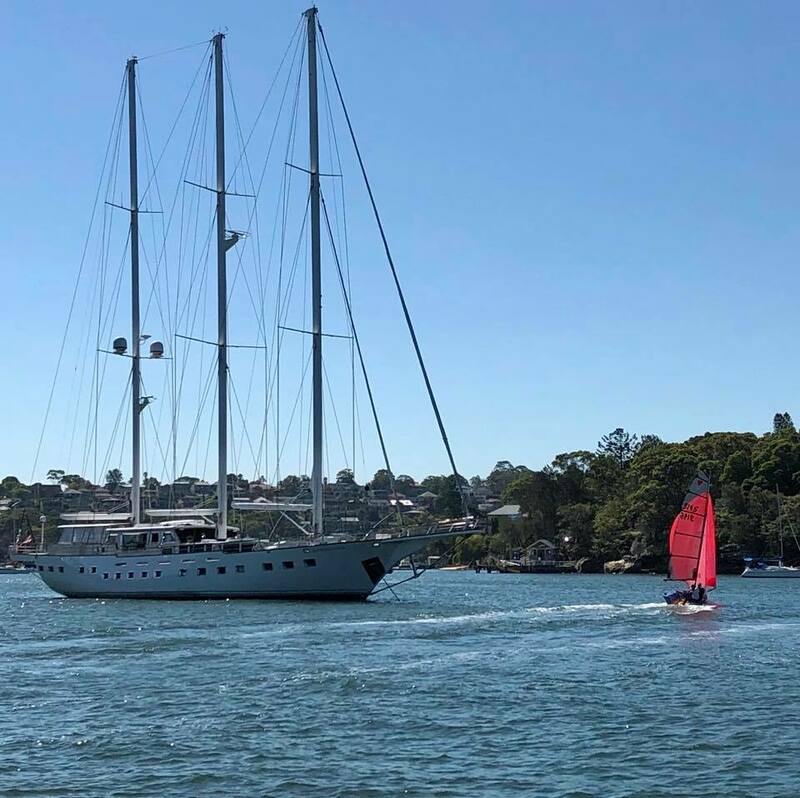 Starting outside of the GFS club house on the Lane Cove River under the bridge to a turning mark (a Sailing Australia permanent mark – better known as YA mark) just off Shark Beach at Nielson Park Vaucluse, then returning to the finish outside of the Club house. We race in Division 1 in these races and somewhat unusually we were the second largest boat in the fleet, substantially smaller than the Young 40 “Flashback” but about the same size as the other 4 competitors, a Jeanneau 32, Elan 320, Dehler 32 and a Robinson 950. We were a crew of three with Ann and Robert working in front of the traveler and your’s truly doing the easy stuff behind it. We were not in a position to fly a spinnaker so our objective was win the work to Nielson Park (Well at least be the 2nd boat there after “Flashback” the Young 40). Racing under the Sydney Harbour Bridge, with it’s fluky winds, washing machine water conditions and the ever present ferries that have absolute right of way entering and exiting Circular Quay. Crossing a number of other race fleets east of the bridge; mixing it with other fleets is not normally an issue but crossing some of the one design fleets of Historic 18 footers (I try to give these guys some latitude as they always seem to be on the edge), modern 18 footers and foiling months does require a lot of concentration and forethought to minimise the effect on either of our races. We also mix it with mixed keel boat fleets from among others the CYC, Royal Sydney and Middle Harbour, while the rules are clear on who has right of way I always feel that a boat working to windward on its own is a lot more maneuverable than a boat under spinnaker in company with its other competitors, so I tend to try to give these guys some consideration as well, especially if I can do it without costing us too much time or distance. Finally the same YA mark could be used by a number of different fleets, Sailing Australia has a rule that these marks must always be taken to starboard (Thank Goodness) but it can be interesting when a few boats racing from different direction enter the zone and leave the mark on courses potentially up 180 degrees difference, again the rules are clear but it does take a bit of planning and tolerance from all concerned. Southern Cloud on Start Line in the Lane Cove River. Photo Johnny East. Yesterday we also had another situation that required some forethought, Southern Cloud a 40 meter triple masted super yacht anchored almost exactly in the middle of or start line. Down Harbour races are started and finished between two permanent marks, one located at the Club the other on the Hunters Hill Sea Scout Building on the opposite shore of the Lane Cove River. After what was out of necessity a pretty conservative start we were able to quickly run down and get well ahead of the fleet, with the exception of “Flashback”, by the time we got to the Harbour Bridge, we were joined by a few of the Etchells that started 5 minutes behind us, It was interesting that while they were able to easily catch us we were able to match their speed until we diverted off onto our own differing course, they went around Shark Island, we had to continue to Neilson Park. It could be that as the winds were a bit lighter west of the Bridge, Etchells friendly conditions, the somewhat brisker winds east of the bridge may have favoured us. The return back to the finish was pretty much a square run so it was to be expected that the guys flying spinnakers would run us down, it was not until Fort Denison that the first of them, “Tana” the Jeanneau 32 and “Hasta La Vista” the Dehler 32 finally caught us, we tried everything, including Gull winging and running angles, but just could not generate the VMGs of the spinnaker flyers. The results do not look that good on paper, but given the circumstances we are very happy with the way G-whizz went and the way we sailed her. Given the conditions, both forecast and actual we could have used the light weight #1 (Wes) instead of the heavy #1 (Reg) which would have given us a bit more speed, especially in he light winds west of the bridge. Ann and Robert did a sterling job and our plan to try and minimise the number of tacks meant that we went a little closer to some shores and further into some bays than we would normally. One of the best tacks we did was about a boat length off Mrs Macquarie’s Chair, right in front of the tourists. We wonder how many holiday albums we will appear in next week.